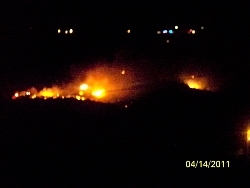 We would like to thank all the residents that volunteered to house animals during the Quail Ridge fire. With out the help of caring individuals this type of emergency help would not be possible. If you would like to be added to the contact list as a volunteer for phone calling, paperwork, animal intake, cleaning or can offer a foster home during an emergency please call the Humane Society at 575-538-9261. Thank you to all the people who donated pet supplies, money and offer foster care to the Quail Ridge Fire Victims, we hope no one was omitted on this list but if you were we hope you forgive us. Jeanie Giante, Susie and Alex Gonzales, Avis Allen, Sandy Shur, Mike Nicolei, Judy Getzwiller, Paula Lynch, Brittany Topmiller, Diana Mason, Ray and Julie Merrill, John Sterle, April Matthews, Karen Denn, Sherri Lyle, Mary and Larry Peterson, Tracey Fortenberry, Rebecca Keller, Jeannie Jones, Peggy Wright, Elizabeth Wright, Margaret Hughes, Frankie and Moose White, Bealls, Food Basket, Sue Sherman, The Orrantia Family, Eileen Varela, Gary and Evie Ford, Deanna Hankins, Marina Rivira, Kimberlee Chase, Randall and Mary Ellen Gose, Leanne and Matthew Ormand, Spoiled Rotten, Mary Nelson, Setta Roberts, Stephen Gurnicz, Isaac Bouch, Shelly Munoz, Marie Sundt, Libby Kufalk, Jown Wiley, Johnny and Linda Poe, Rebecca Brown, Sarah Fielder, Shoni Eaves, Pat Venderly, Wayne Erickson. Copy and print this card. 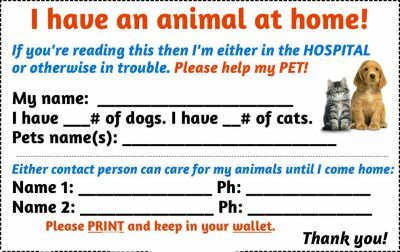 Place in your wallet to help your pets in case of an emergency.